When startups are acquired, there are many considerations in accepting an offer. Does the vision of the acquirer fit the startup? Will the startup operate independently or be integrated? What is the price and structure of the transaction? Most of these questions have to be answered through extensive conversations with suitors. As for the structure of the acquisition, there’s data that can be used for benchmarking. I’ve assembled about 2400 M&A events of venture-backed technology companies since 2000 to compare the fraction of the total consideration which is stock and cash. There are two trends in the data: how the cash/stock split changes over time and how the split changes with the size of the outcome. The first chart below shows the trends by size. The x-axis shows the Acquisition Value in $M and the y-axis shows the cash share. Each circle is one transaction. Three conclusions are evident from the chart. 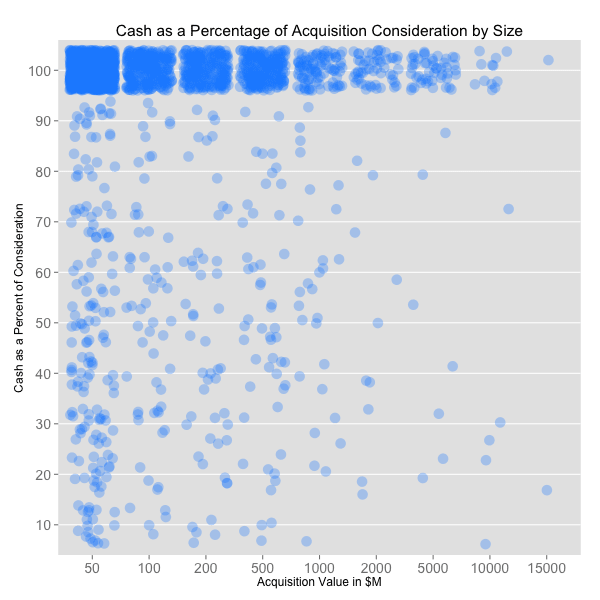 First, 83% of these acquisitions were cash only. Only 1.5% of transactions were consummated with less than 10% of the value in cash. Second, the larger the transaction the more likely stock will play a significant role. The table below shows the trend of the average cash split falling from 92% to 57% for the very largest M&A. Third, a power law governs acquisitions. 50% of transactions had values of $50M or less; 64% of transactions were for less than $100M. 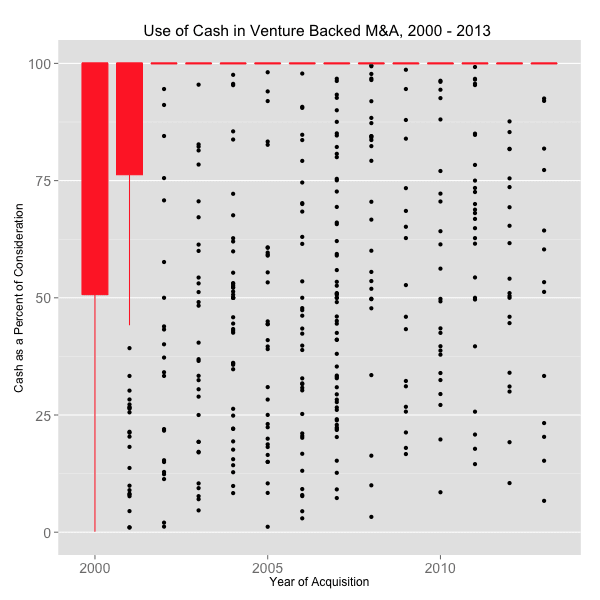 The second chart, below, is a boxplot of the cash share of the acquisition. The red box represents the 25 to 75% quartiles and each black point is an outlier (greater than 2 standard deviations from the mean). In the dot-com boom, when stock was cheap and plentiful, many acquisitions had considerable stock components. Over time, however, as the technology companies’ balance sheets have become cash rich, the trend has progressed from 77% cash to 94% cash in 13 years. Perhaps as SaaS valuations continue their stratospheric rise and stock becomes cheap, incumbents acquihire startups or bolster their product offerings with add-on acquisitions, the stock/cash split may revert more to the mean. But today, cash is king.